The GMB has become the largest union to date to back a referendum on the outcome of the Brexit negotiations, urging Labour to "follow suit". 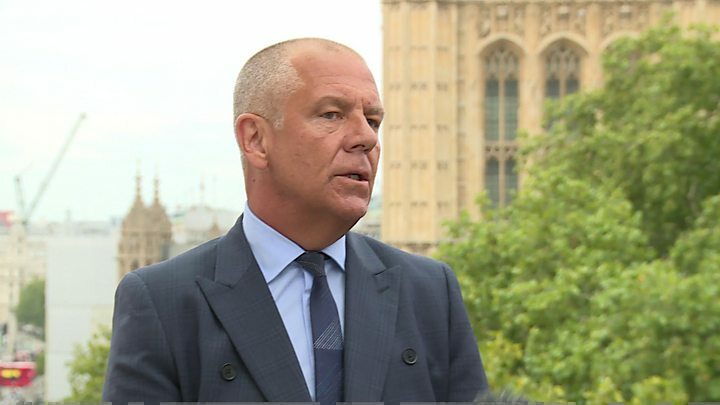 General Secretary Tim Roache told the BBC "false promises" had been made during the 2016 referendum and it was time to "let the people decide". But he said that the vote should be on the terms of exit, not on whether Brexit would actually happen, which he said had already been decided. The UK is to leave on 29 March 2019. The cross-party People's Vote campaign, which is backed by the Lib Dems and Greens as well as many Labour MPs, has said a referendum must be held on the outcome of the negotiations with the EU, including the option to remain in the bloc. GMB said it had consulted its 620,000 members before its executive committee chose to endorse the idea of a new referendum. While it respected the outcome of the 2016 Brexit vote, it said the reality facing the British public was very different from what they voted for. "People voted for change," Mr Roache said. "They voted to take back control. They did not vote for economic chaos or to put jobs and hard-won rights on the line." "In trade union terms if we negotiate a pay deal for our members we put that deal back to the members and they decide whether that's acceptable or not. "We have no faith given what's happened in the last few months in this government delivering a Brexit deal that works for working people. "If the government are comfortable with that, well let's let the people decide then." A number of unions, including the TSSA and Royal College of Nursing, have backed a further referendum although Unite, the country's largest, has so far stopped short of doing so. In July, it said it was "open to the possibility" of another EU referendum "depending on political circumstances" and its priority was planning for a general election. The Labour leadership has said that a new referendum is not party policy but senior figures have suggested no options should be taken off the table as the negotiations enter a crucial phase and Prime Minister Theresa May attempts to negotiate a deal next month. Mrs May has insisted there will be no new vote under any circumstances and her Chequers plan for Brexit delivers on the result of the 2016 referendum. Updating MPs on negotiations on Tuesday, Brexit Secretary Dominic Raab said "dangling" the prospect of another vote at this stage would invite the EU to give the UK "the very worst terms".